At Videoslots.com we offer this popular scratch card game Dragons Fortune. Dragons Fortune is very easy to learn and the design and graphics will let you relax and get excited at the same time. You will find several bonus features that you will want to hit. The multipliers go from x2, x5, x10, x100, x250, x1000, x10000 and all the way up to the jackpot which is x20000! Just click the Play button and let the dragon spit out his pearls and match the pearls to win. Hit the top match and the jackpot is yours. On your way through the Dragons Fortune you just want to go for the multipliers. It is as simple as that! 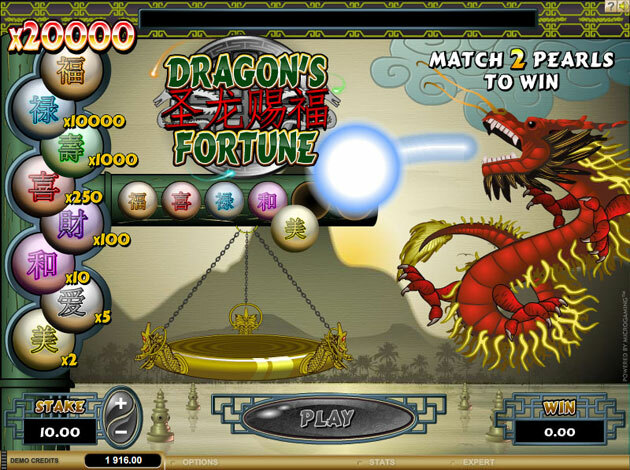 Good luck playing this entertaining scratch card game at Videoslots.com, the Dragons Fortune.